Travel is synonymous with adventure, and no trip – be it local or international – is complete without a little escapade that adds sheer excitement causing your heart to beat faster. The adrenaline and adventure junkies at Red Bull have put together a list of 101 top adventures around the world to add to your travel bucket-list, and it features two of SA’s prestigious natural attractions. 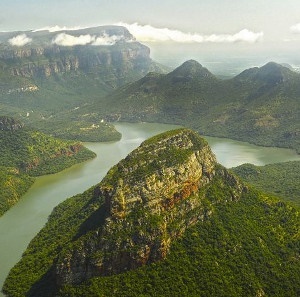 Placed number 43 on the list is Kruger National park, while Mpumalanga’s Panorama Route came in at number 55. The adventure-seekers suggest that hiking SA’s northern parts of Kruger is a must-do activity, as opposed to the self-drives or guided safaris, as this section of the Park is a less-known attraction that’s cut off from the main game trails. Red Bull says that the best way to see the wilderness here is on foot by following the Pafuri Walking Trails. Under the leadership of experienced field guides, you can venture through the Limpopo River Valley, Crooks Corner, Hutwini and the Luvuvhu fever tree forest. July to September is the best time to explore this section and spot elephant, eland and a variety of bird species. Road-tripping through the Panorama Route also made it on Red Bull’s bucket-list adventures, and it’s no surprise as this route features a concentration of natural marvels along a short drive. See spectacular waterfalls, vast mountains covered in lush greenery, Blyde River Canyon – which is the largest green canyon in the world, mind-blowing rock formations at Bourke’s Luck Potholes, take a peek through God’s Window, and explore the sights and sounds of wildlife as well as a mix of cultures. While Red Bull have added only two SA attractions to their bucket-list of must-experience global adventures, we can give you many more than just two must-do Mzansi adventures. From mind-blowing hiking trails along rugged coastlines and dense forests, to shark-cage diving, swinging between mountains and extreme water-sports, here are some of SA’s top adventures to add your travel bucket-list. This 5-day hike along the Garden Route’s coastline offers a range of hiking terrains from the rocky shore to height of 150m – all boasting breathtaking views – making it no wonder that the trail was named best in the world in 2017. There are many shark cage diving companies operating this activity along SA’s coast but Gansbaai and Mossel Bay offer experiences in the waters of mainly Great White sharks. If you don’t mind being caged while these predators swim around, then this is certainly a bucket-list experience for you. Go on an adrenaline-packed activity in the heart of Elgin with a Cape Canopy Tour zipline between mountains, over spectacular waterfalls and an abundance of fynbos. There are 11 ziplines throughout the course which takes about four hours to complete. Apart from being emotionally prepared, one needs to be physically fit and prepared for a hike up a mountain, back to the point of collection. Apart from the tour in Western Cape, there are a number of canopy tours to enjoy in different landscapes, across SA. Immerse yourself in SA’s varied natural heritage at different parts of the country through hiking trails for all levels of fitness. Some iconic SA hikes – in addition to the Otter Trail – include the Amphitheatre Heritage Hike through northern Drakensberg. Marvel at the mountain’s amphitheatre, and best of all, you can stay in caves while on the three-day trek. Try out De Hoop Whale Trail for a two-in-one experience – hiking a unique part of SA while whale-watching. Also try out the Garden Route’s Outeniqua Hiking Trail, considered one of the toughest hikes in SA as it may only be done in one direction. Apart from the hike to see amazing views of the iconic Amphitheatre, you can also check out Tugela Falls - the world's second tallest falls and highest in Africa, plunging 948 metres - and then do some plunging of your own with the King Swing – a 17-meter free-fall from a treetop platform. SEE: WATCH: This drone in the Drakensberg will make you pack your hiking bag, stat! Discover diversity below the ocean along KwaZulu-Natal’s northern coast by snorkelling among the beautiful coral and sea life at St Lucia, Sodwana and Kosi Bay at iSimangaliso Wetland Park. The Park is a World Heritage Site which is home to some of the oldest species of ocean animal life, and prehistoric fish species called coelacanths were recently rediscovered in these waters at depths of over 100m. Explore Oudtshoorn’s 20-million-year-old limestone caves, an underground wonder of the Klein Karoo. Swartberg Mountains forms the backdrop of these dripstone caves, which visitors can explore through heritage or adventure tours. Take a leap of faith and hop off Bloukrans Bridge near Plettenberg Bay. At 216 metres high, Bloukrans Bridge Bungee is the world’s highest bungee jump off a bridge, at 216 metres with a 5 second free-fall.